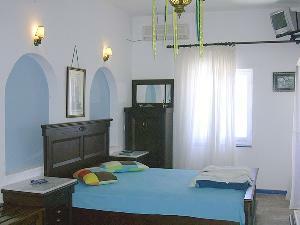 The double rooms, which are above the apartments, have a double bed, fridge, TV, A / C, bathroom and balcony with superb view on the Caldera and the Volcano. 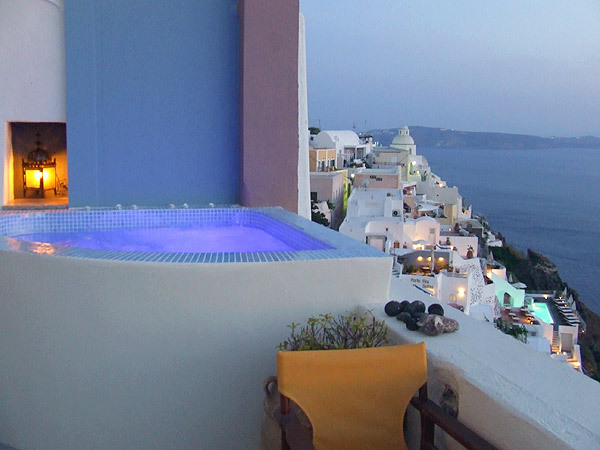 The triple rooms, which are above the apartments, have a double bed, fridge, TV, A / C, bathroom and balcony with superb view on the Caldera and the Volcano. 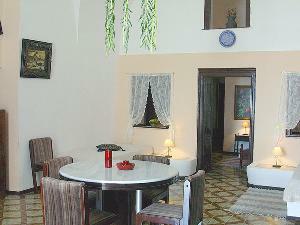 The Cave Apartments can accommodate up to five people. They are equipped with kitchen, bathroom, one bedroom with double bed, three beds, living room or dining room, TV and Jacuzzi. I was a bit reluctant to book a room at Iriana's Apartments as there weren't that many reviews online. 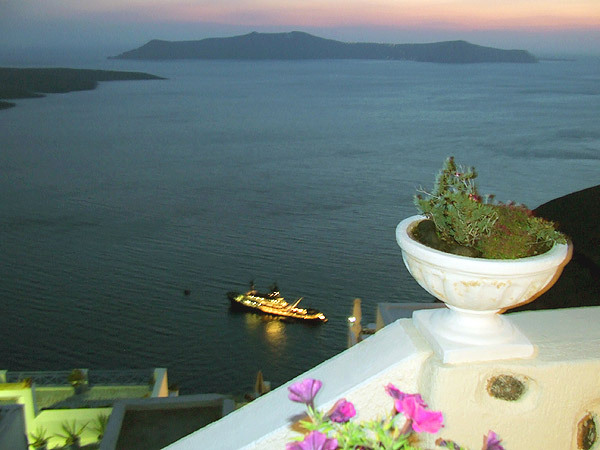 However, the photos looked good and it was an unbeatable price for a caldera view. I am happy to report that my stay at Iriana's Apartments was truly phenomenal and far exceeded my expectations. First, they offered free transfers to/from the ferry port and airport. Service was prompt and efficient. Second, breakfast was included, which was delivered to our room each morning. It consisted of a sumptuous buffet of coffee, juice, fresh fruit, yogurt, hard boiled eggs, chocolate croissants, toast with jam/butter, and warm ham & cheese panini. 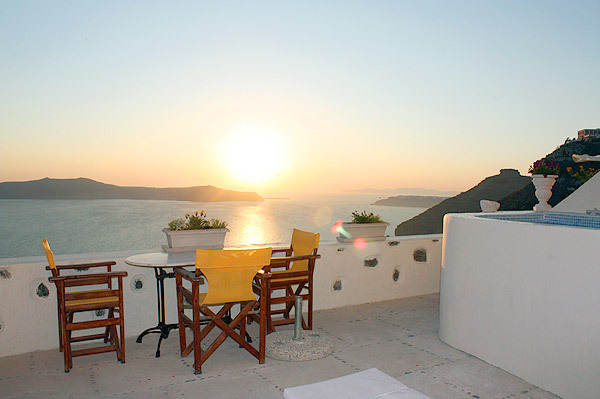 It was simply marvelous having breakfast on our balcony overlooking the jaw-dropping cliffs of the caldera. The room itself was handsomely furnished with refrigerator, satellite TV, and attached private bath. It was like staying at a comfortable B&B. Currently, there are 5 units available, but I think Iriana mentioned they will be doubling their capacity in the future. 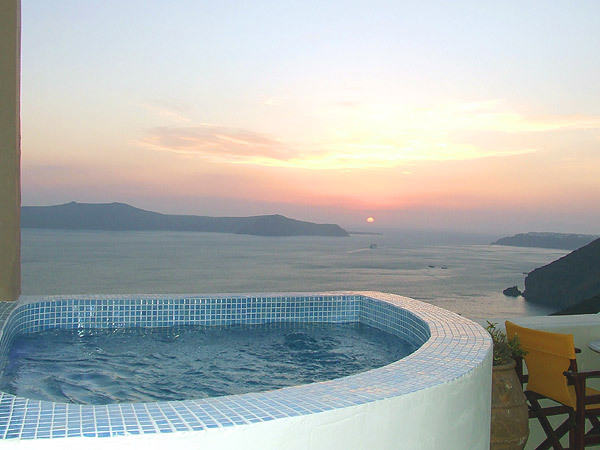 There are also 2 hot tubs available to use which overlook the caldera... simply magnificent. Iriana is an affable hostess and was available throughout the day for sage advice on which beaches are the best to visit. I really enjoyed Perissa and the red sand beach at Akrotiri. The location of the apartments is unbeatable and just below the hustle and bustle of the famous Gold Street (although the apartments themselves are quite quiet). The bus station (to get to Oia and the beaches) as well as the grocery store are a 5 minute walk away. 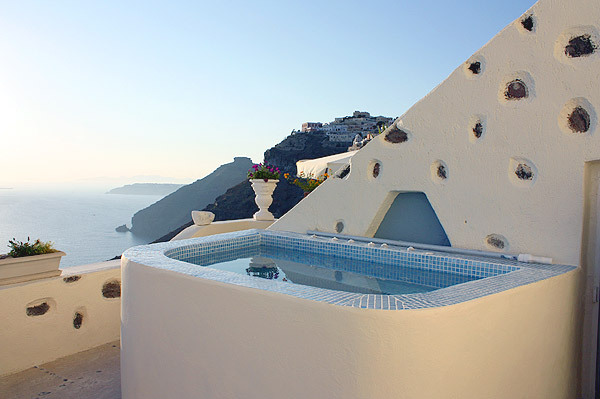 I thought about staying in Oia instead, but I am so glad I stayed in Fira as it is much more centrally located to the seaport/airport and beaches. In summary, the location of Iriana's Apartments is really unbeatable. 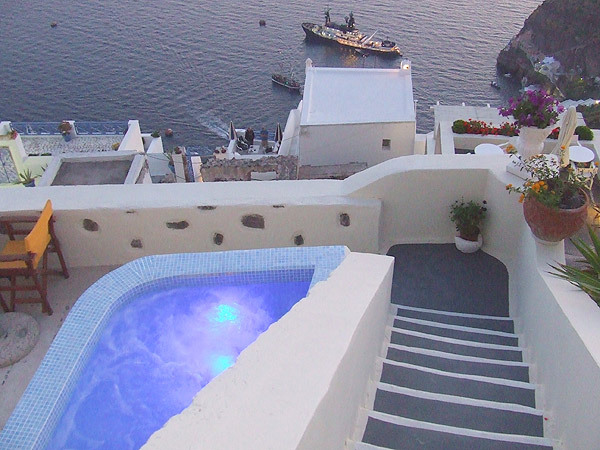 I was also happy I didn't have to climb too many steps from the main street to get there (as is the case with many hotels in Santorini). I'd recommend Iriana's Apartments in a heartbeat. Enjoy the view!! I booked Irianas thinking it was a hotel. My partner and i arrived by ferry to Santorini and someone was already there at the dock waiting to take us to Irianas. When we arrived we couldnt believe our eyes. We honestly had the best view of the caldera from our room. Not to mention we had our own spa pool. We ate breakfast by the pool which they bring to you when u wake up and had cheese and wine every afternoon whilst watching the sunset. Not only was the view amazing but the room was too! We had our own spa bath in the bathroom and you could actually sleep 4 people easy in our apartment. Irianas is unbelievable and it is so cheap!!! there are places nearby charging a fortune and i guarantee it wont be as good as Irianas.